Hubby bought a lot of strawberries. It's a freshly picked berries. I don't know what to do with it. We are only 2 here in the house and we can't eat them all. So what I did, I check in the internet for a recipe that I can use the strawberries. The recipe that I used was taken from Joy of Baking. * Preheat oven to 350 degrees F. Position rack in center of oven. Line the muffin pan with paper liners or grease with butter or a baking spray. Set aside. * In a small saucepan, melt the butter. Set aside. * In a medium sized bowl, whisk together the brown sugar, eggs, vanilla extract and mashed banana. Add the melted butter to the brown sugar mixture and stir to combine. * In other large bowl, combine the flour, baking powder, baking soda, cinnamon and salt. Gently fold in the berries, making sure they are coated with flour. This helps to prevent the berries from sinking during baking. Do not over mix or the berries will end up coloring the batter. Add the wet ingredients to the dry ingredients and stir only until the ingredients are just combined. Do not over mix the batter or tough muffins will result. 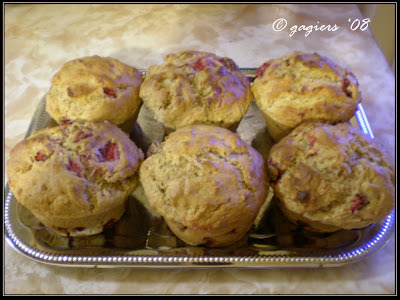 * Fill each muffin cup about two thirds full of batter, using two spoon or an ice cream scoop. Fill any unused muffin cups halfway with water to prevent warping of the pan and or over browning of the muffins. Place in the oven and bake until a tester inserted in the center of a muffin comes out clean 20 to 25 minutes. Transfer to a wire rack to cool. Make 12 regular sized muffins. Enjoy!